RHD is a heart disease or cardiac inflammation mostly common in people from 5 to 25 years of age. It is a complication of rheumatic fever which starts as strep throat generally leading to acute or chronic heart disorders. 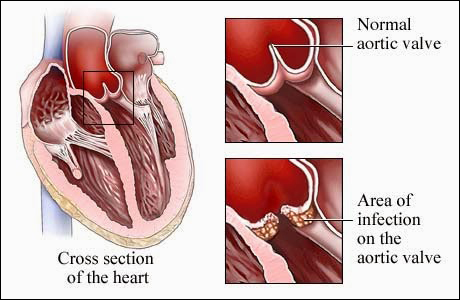 In this fever, the heart valves get damaged leading to valve disorder. This forces the heart to work harder to pump blood and may cause heart failure over time. RHD is triggered by autoimmune reaction to the infection with group A streptococci. It may affect the connective tissues of the body like heart, joint, brain and skin. Children who get repeated strep throat infections are at more risk for rheumatic fever and RHD. According to Ayurveda, Rheumatic fever is known as Amavata Jwara which means the fever where patients getting swellings and joint pains. It happens due to imbalance in digestive power in the body. The most common symptoms of RHD are include sore throat which is caused by strep infection. Fever along with painful, swollen, tender, red joint like knees, ankles, wrists elbows or shoulder. Uncontrolled movements of arms, legs and facial muscles. Other symptoms are loss of appetite, excessive thirst, loss of taste, trouble swallowing and constipation. Some may experience thick, bloody discharge from the nose. To diagnose RHD, the doctor asks if strep throat episodes occurred recently and use a stethoscope to hear the heart murmur.The doctor often checks for inflammations of joints. A chest X-ray, Echocardiography, Electrocardiogram, MRI of the heart and some blood tests are done to confirm the condition. 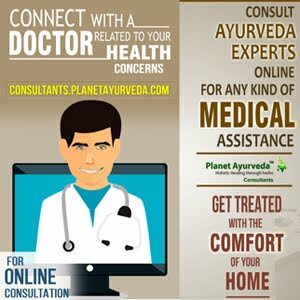 Rheumatic fever is known to be treated in Ayurveda by toning the digestive system. It is important to modify the life style and develop healthy eating habits to manage RHD. 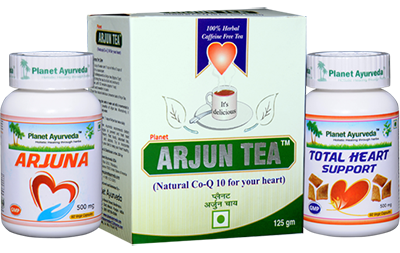 Arjuna tea is made from Arjuna herb which is considered very heart healthy due to its COQ10. In tea form, the medicine helps in conditions of arterial plaque built up and improves the blood flow. It works towards strengthening heart muscles. The tea is recommended to maintain normal blood pressure. Arjuna tea is easy to consume and is free from any side effects. Dose: It is recommended to take 1 cup of Arjuna tea, preferable two times a day. These are made from Terminalia Arjuna herb which is very beneficial in treating conditions like angina, high blood pressure, weakened heart muscles, tiredness. The medicine helps in strengthening the heart muscles thereby increasing heart's ability to pump blood. The medicine is great in normalizing the blood pressure. It improves the body's ability to absorb lipids too. The capsules are 100 % vegetarian and are free from any side effects. This medicine is very effective in treating blocked arteries. Dose: It is advised to take 2 capsules of Arjuna, two times a day with plain water. As the name suggests, these capsules are known to provide strength to the failing heart muscle. Total Heart Support capsules are made of four special herbs: Arjuna, Ashwagandha, Brahmi and Shankhpushpi. They work towards cleansing blocked arteries and are very beneficial in post heart attack recovery time. The product is an excellent remedy for Congestive Heart Failure and Coronary Heart disease as well as breathlessness due to weakness of heart muscle. It helps in keeping blood pressure and cholesterol under control. It is a great remedy for relieving stress and anxiety. These capsules are pure, safe, organic and made of natural herbal ingredients which are free from any fillers, additives, binders and gluten. Dose: It is advised to take 2 capsules, two times a day after meals with plain water. These capsules are pure herbal product highly beneficial in treating edema and water retention in the body. The product reduces swellings and inflammation and helps in maintaining efficient kidney function. It possesses bitter, cooling and astringent properties and helps in balancing the three doshas. Dose: It is advised to take 1 to 2 capsules twice a day with plain water after meals. Gotu Kola capsules are made from Gotu Kola (Mandookparni) herb which is very useful in treating any bacterial, viral infections. It relieves fatigue, anxiety, depression. Gotu Kola contains chemicals that decreases inflammation and blood pressure in veins. The capsules balances the three doshas. Dose: It is advised to take 1 to 2 capsules twice daily with plain after, half an hour after meals. These capsules are made of a popular herb known as Indian ginseng or Ashwagandha. The herb has anti-inflammatory, antihistamine properties, anti-stress, antioxidant, anti-tumor, as well as rejuvenating properties. It is an adaptogenic herb and is useful in strengthening body's immune system. The medicine gives strength to the heart muscles to overcome cardiac ailments. It is highly recommended in high blood pressure and is very useful in improving blood circulation and reducing inflammations. Dose: It is advised to take 1 to 2 capsules with plain water after meals. It is suggested that the patient takes complete bed rest during the fever. One needs to take soft, warm food that is easily digested. Fried foods, oily foods, sour foods, excess sugar or salt and refined flour should be avoided completely instead one should opt for boiled vegetables. One needs to include grape fruits, oranges, strawberries, grape juice, amla, nuts, garlic, ginger, olive oil, celery, basil, nettle in diet. Avoid alcohol and smoking. Yoga is very beneficial in treating and managing RHD. Asanas like Siddhasna, Shavasana, Paravatasna, Mandookasana, Padmasana, Shaskasnan are very beneficial.